September 2014 sees the launch of a new series of tattoo prints, one of the most long-lasting themes in my woodblock print work, with an unusual new method for creating the tattoo design. The first print in this series is called Kasa (Umbrella or Umbrellas), due to the two umbrellas in the design, purple behind the model and green in the tattoo itself. 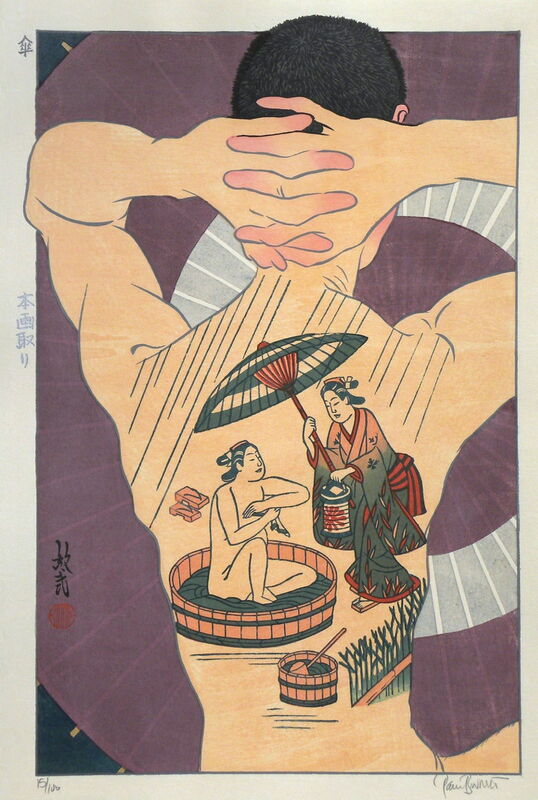 Happening upon an antique woodblock, by an anonymous artist of around 1720-30, I was inspired to reuse the image which shows two figures, one protecting the other from rain with an umbrella while the latter is taking a bath outdoors. I decided to colour the antique keyblock/tattoo in benizuri (pink printing) colours, a limited palette of orange-pink, green and russet-pink, used for woodblock print production around the time the block was carved, a stage on the way to full-colour printing later in the 18th century. I decided to call this series Hon Ga Dori, a variation on the literary phrase Hon Ka Dori, a technique in Japanese poetry for using phrases from past poems in new works to add to the richness of the imagary. Since in this series I shall be recycling antique blocks as the tattoo designs, it seems to me I'm doing something very similar to the old poets, quoting from the masters of the past to add lustre to my new works. The title is printed in silver metallic ink in the left margin, and the extra-large size of these sheets is the same as my recent Bijin (beauties) series, at 47 x 33cm (18.5 x 13 inches). The design is produced in an edition of 100.